A Brochure is a small piece of paper, designed to deliver the message of a business organization to its besieged audiences. Within its short cover, it needs to lay out the reasons discreetly why it should be read or looked at. Apart from being unique in designing concept, it should state the statement of a business organization strongly to the existing clients and to the possible customers. Portraying the message of an organization by using simple fonts, images and symbols should be the only objective of brochure designers. Mining, synchronization and execution are the three fundamental steps of brochure design. Mining of creative ideas from various sources, synchronization of multiple contrasting concepts and their effective implementation needs to be executed in the hands of some extremely talented professionals who know how to shape a difficult concept. We at Quad SoftTech strongly believe that only good designing concept gets rewarded in the long run. 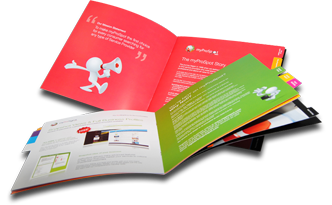 Equipped with modern technologies, our brochure designers can offer you the very best service. Our Brochure design service helps business firms of all sizes and industries to convey their message with professional and high quality design brochure & catalogues, advertising material, newsletters etc. Whether you need any promotional mailer, tri-fold brochure, sales brochure, product brochure, training manuals, marketing brochure or a catalog we have a proficiency and skill to deal with and deliver it to you. At Quad SoftTech, our creative design team assesses your objectives, research to create corporate brochure or catalogue design as per your requirement. Be with us to give an extra edge to your marketing campaign.